The new fuel efficient Honda CR-V 1.6 i-DTEC has arrived in our Howards Honda dealerships today for demonstration, following the release of the new variant and the new advertising campaign launched by Honda to emphasise the benefits of the SUV. With the tagline, “An impossible, made possible”, the new TV advert, launching on TV on 19th October, emphasises the clever qualities of the new CR-V 1.6 diesel model. The advert depicts the car driving through a number of optical illusions, seemingly demonstrating the hidden qualities and functionalities of the car, including the all-important fuel efficiency whilst not compromising driving performance. It is believed that the new campaign was launched in order to tackle the preconceptions that often come with SUVs, and in particular the fuel-efficiency, the new CR-V has an impressive 62.8 mpg fuel consumption rate, one of the best fuel efficient SUVs on the market. The SUV also allows for 1669 litres of luggage capacity, providing ample room for passengers and their bags. The new SUV provides the easy handling of a car, but with the extra practicalities of the added space that comes in an SUV. The British-built new diesel CR-V is now available at Howards Motor Group, with prices starting from £22,800 and finance options starting from just £239 per month with 0% APR on a PCP 3 year plan, together with 5 years’ complimentary servicing. 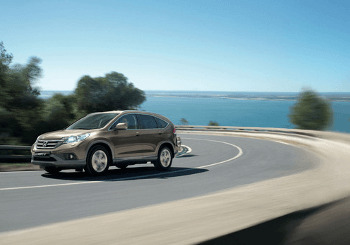 If you would like to know more about the new generation of Honda CR-Vs, contact us today and book a test drive. Alternatively, you can visit either our Weston-super-Mare or Taunton dealership.